My son turned seven today. Anemo was born in Ethiopia in April of 2007 and became my son in February of 2009. But that's a story for later. Recently, I decided to use Anemo's birthday to launch what I am calling the Amharic Project. The goal of the project is simply to become as fluent as possible in Amharic, the official language of Ethiopia, in one year...by the time Anemo turns eight. That's the big, ambitious, rather abstract goal. Such goals need to be broken down into smaller steps for the student to recognize progress, and I am working with a language acquisition specialist to do just that. Jan Marston, who lives in Des Moines, Iowa, has dedicated her life's work to figuring out how people ideally learn a foreign language. She speaks no Amharic whatsoever and doesn't plan to. Instead, she's helping me both think theoretically about language acquisition AND break the process of language acquisition down into realistic, incremental, concrete steps. Anemo's birthday dinner tonight certainly felt meaningful. My wife and I took Anemo to one of his favorite restaurants: Oasis Cafe at the corner of McAllister and Divisadero in San Francisco. The Ethiopian food here is among the best we've had, and the environment is consistently warm and friendly. Abeba Gedam has always been so kind to our family, and tonight she delivered a complementary chocolate muffin for Anemo (candle included! ), after we had polished off a delicious vegetarian sampler. 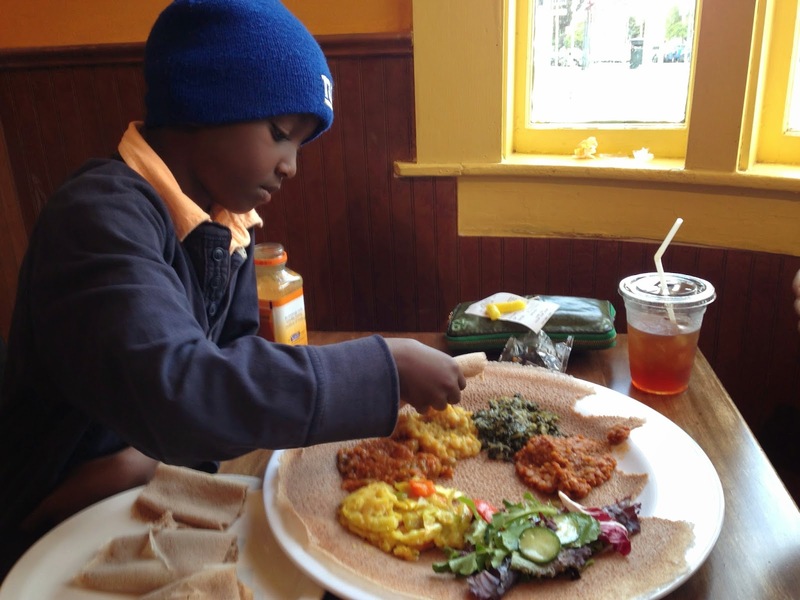 Anemo using the injera to pick up his dinner. He likes the milder yellow lentils (misir wot) the best. Anemo is wearing a hat because his head was recently shaved at Westside Cuts just a block away. Abeba and Anemo with birthday treat. We learned that Abeba's son, Nobel (can't hurt, right? ), turned thirteen yesterday. So the project is launched. And I only spoke two words of Amharic today...the two I already knew: selam (hello) and amaseganalu (thank you). I have a long way to go.